This article will cover the top 6 reasons you should work out with an Elliptical Cross Trainer. The Elliptical Cross Trainer has become one of the most popular methods of exercise for the reasons you are about to discover right here in this article. This exercise machine has easily risen above that of the treadmill and other exercise equipment because of its overall workout scheme. So sit back, relax, and read on. You will learn the many different reasons that you too should be working out with an Elliptical Cross trainer. Reason number one – An elliptical cross trainer provides the user with a workout using weight-bearing exercises. A weight-bearing workout works to improve a wide variety of aspects of your body. For example, by using an elliptical cross trainer you can increase your bone density, improve conditioning, burn calories, and strengthen your muscles. All by using one exercise machine. Reason number two – With an Elliptical Cross Trainer you will receive a low impact workout. This is extremely important to anyone who chooses to exercise to maintain his or her health. A low impact workout means you are putting less stress upon your bones and joints while you are exercising. The trainer has pedals that you use during cross training and your feet will never have to leave those pedals. This decreases the amount of impact placed on your body. Reason number three – Improve your overall fitness by using an extensive cardiovascular workout. This is one of the key factors that tempt many people to exercise with an Elliptical Cross Trainer. A cardiovascular workout is essential to promoting good circulation and overall heart health. Reason number four – With your Elliptical Cross Trainer you will receive a total body workout. From head to toe and everywhere in between, the Elliptical Cross Trainer allows you to work every muscle. Some other exercise machines only work on specific areas of the body, meaning you would need a few different machines for a full body workout. 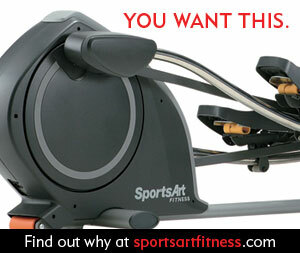 The elliptical cross trainer does that for you with one machine for a total body workout. Reason number five – Lose weight with an elliptical cross trainer. Because the cross trainer gives your entire body a workout, with exercise and a proper diet you could find yourself losing weight while toning your body at the same time. Reason number six – Maximum results in less time. This is another key factor that lures people to the Elliptical Cross Trainer. Because you get a total body workout, those with a busy life and little time left to spare find that exercising on the elliptical cross trainer provides you with maximum results in less time. This allows you to get the benefits of exercising and still have enough time in the day for other activities. As you can see, there are many benefits to working out with an Elliptical Cross Trainer. If you find the proper machine, do the right exercises and follow a healthy diet regimen, you will have no problem benefiting from all that an Elliptical Cross Trainer can offer.